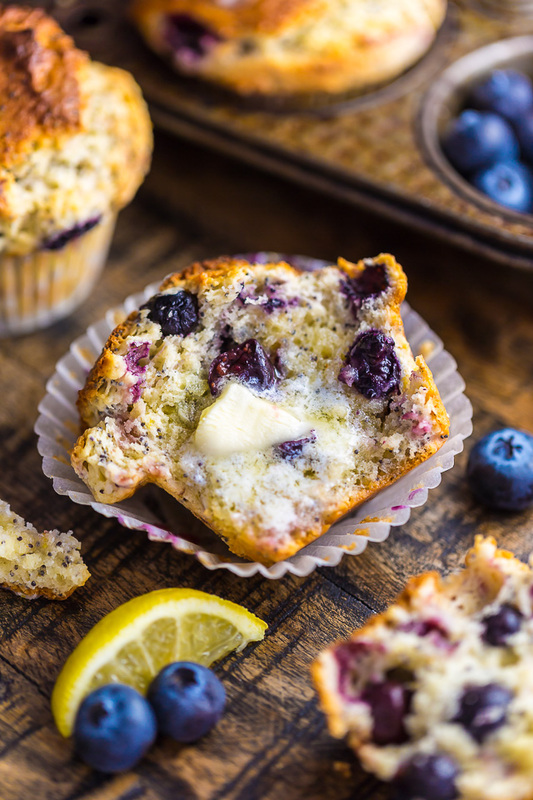 These BIG bakery-style Blueberry Lemon Poppy Seed Muffins are so darn good! Especially with a cup of coffee. 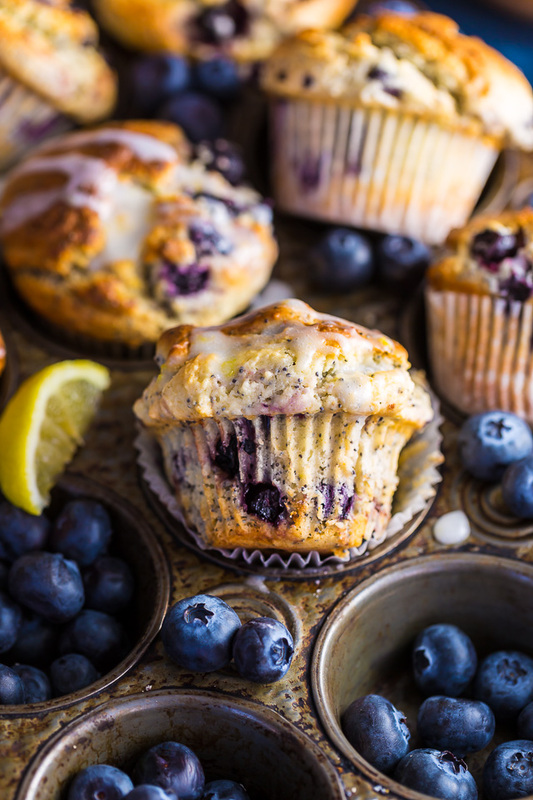 but blueberry lemon poppy seed muffins? It’s not just like; it’s love. Because we all know sweet, juicy, bursting blueberries make everything better, right? I’ve baked these poppy seed muffins 4 times in the past month and everyone always goes crazy over them! 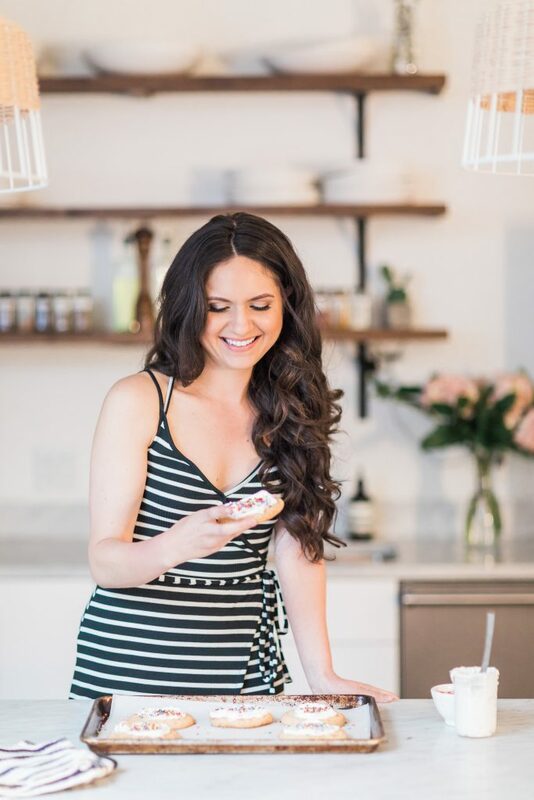 I brought them to a meeting, a lunch date, a family party, and… pilates! Because balance, right?! 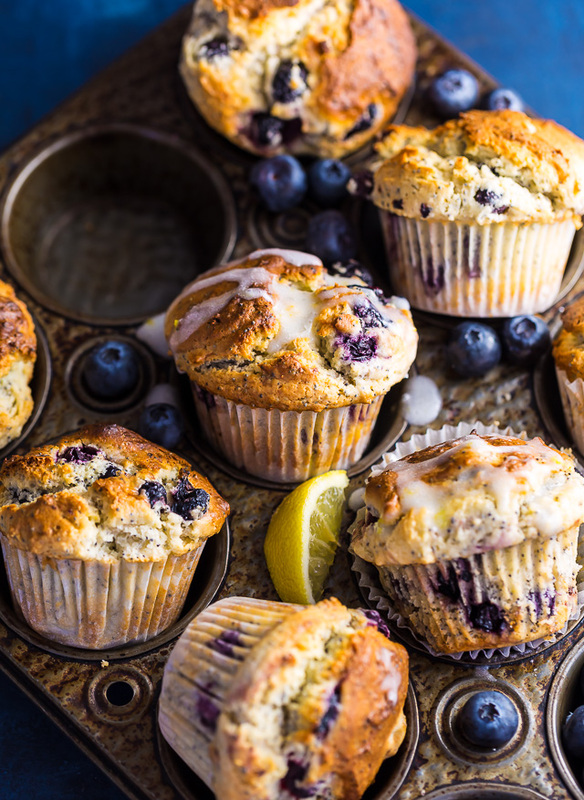 But seriously, these muffins are super versatile and easy to travel with. And the flavors are hard to resist! The lemon flavor is bright without being overwhelming, the poppy seeds add a nice toothy crunch, and the blueberries? Well as I mentioned above… they just make everything a little better. The sweet lemon glaze is optional, but absolutely delicious! 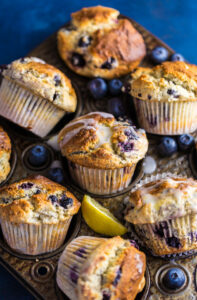 I used fresh blueberries in this recipe, but have a feeling frozen would work. Just be sure not to thaw them before adding to the batter. 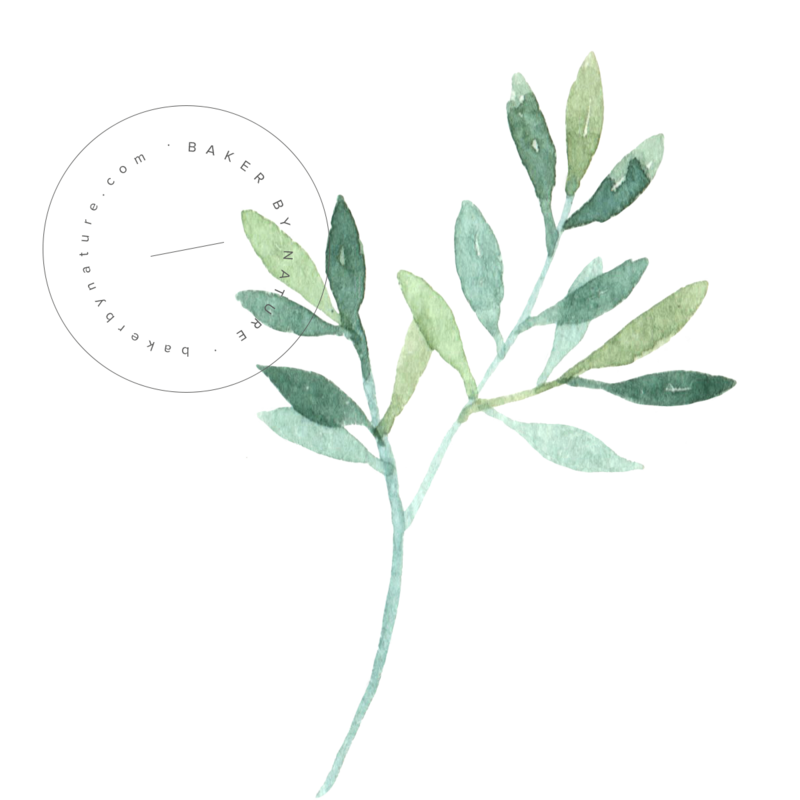 This is probably obvious… but you must use fresh lemon juice and zest. Because this is where the lemon flavor comes from! You’ll want to zest the lemons first, then cut them in half and juice them. 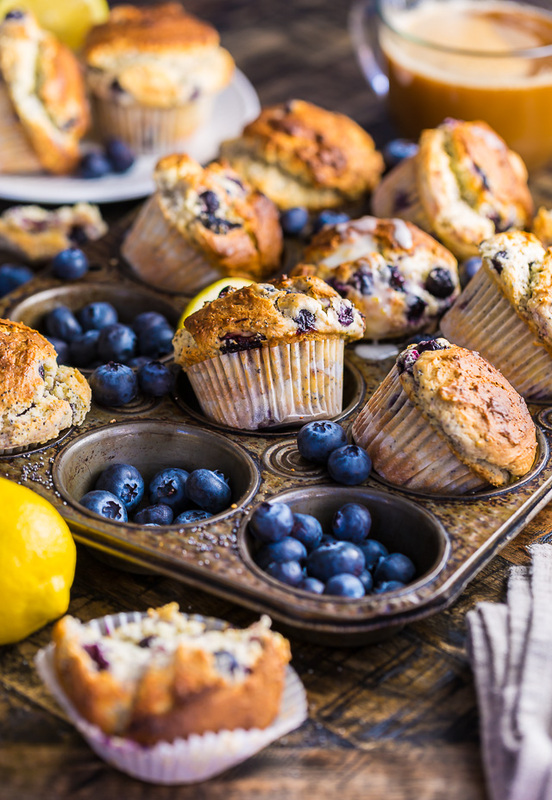 I suggest buying 4 or 5 large, heavy lemons so you have enough on hand for the muffins and the glaze. You can use regular lemons or meyer lemons for this recipe. Before assembling the muffin batter, you’ll want to bring your butter, eggs, and sour cream to room temperature. The batter will be very thick! Avoid over mixing it or your muffins will bake up dense. To avoid over baking, keep an eye on your muffins after the 20 minute mark. In my opinion, these muffins are best eaten warm the day they’re made, but they’ll “keep” in an airtight container for 48 hours. I suggest glazing the muffins right before you plan on serving them. This ensure the tops don’t get too moist and soggy. This will also help prevent premature molding. 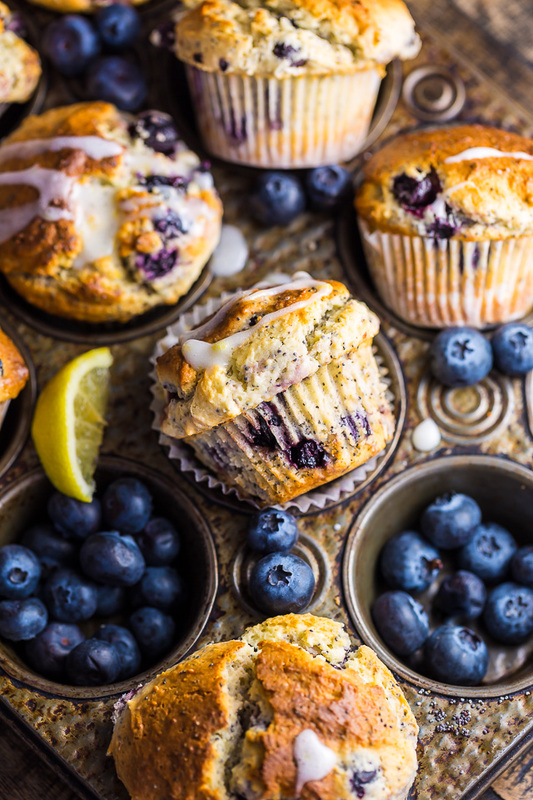 Perfect for brunch, picnics, play dates, office parties, weekday snacks, and beyond, these Blueberry Lemon Poppy Seed Muffins are sure to be in heavy rotation year round! Preheat oven to 400 degrees (F). Line a 12 cup muffin tin with paper liners; set aside. In a large bowl, sift together 3 cups of the flour, baking powder, and salt; set aside. In a large bowl using a handheld electric mixer, or in the bowl of a stand mixer fitted with the paddle attachment, combine the butter, sugar, lemon zest, and vanilla extract; beat on medium speed until light and fluffy, about 3 minutes. Add in the eggs, one at a time, beating well after each addition and scraping down the sides of the bowl as needed. Turn mixer off and set batter aside for a moment. In a spouted bowl or measuring cup add the sour cream and lemon juice; whisk well to combine and set aside. In a separate bowl combine add the blueberries and remaining flour; toss well to coat the berries in the flour. With the mixer speed on low, alternate adding the flour mixture and the sour cream mixture, beginning and ending with flour. Be sure not to over mix here. 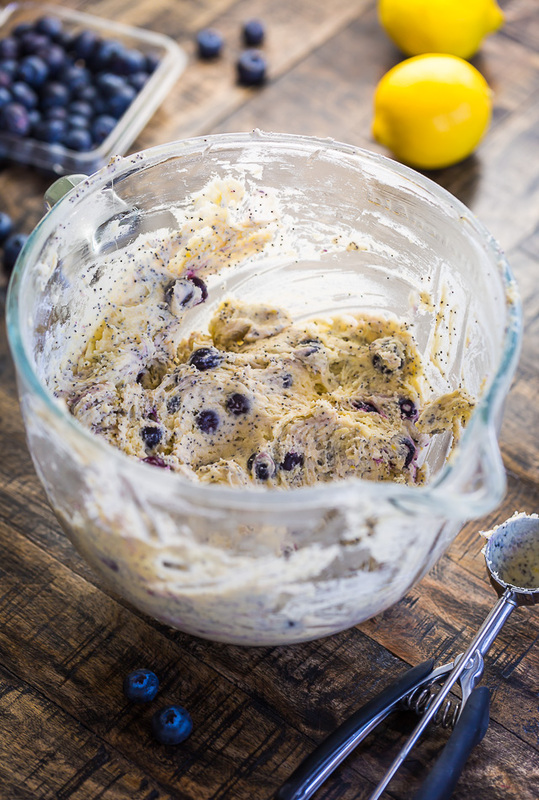 Fold the blueberries and poppy seeds into the batter, mixing just until evenly combined. 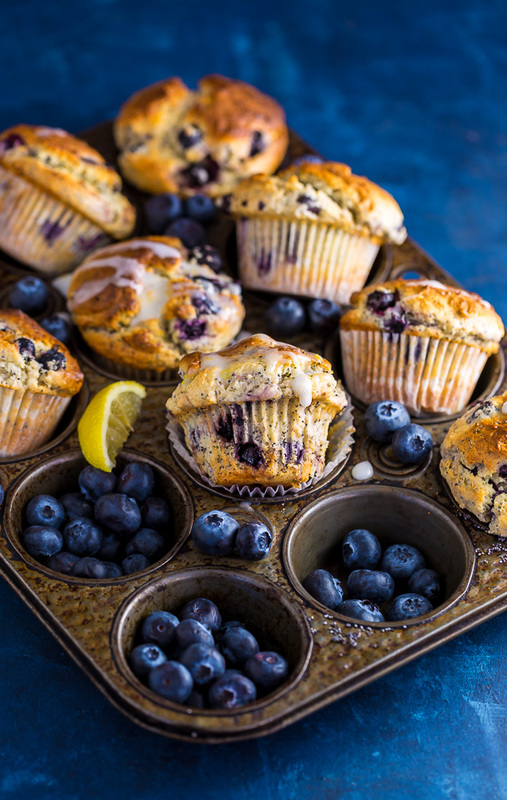 Divide the batter evenly among prepared muffin tins. Bake for 25 to 27 minutes, or until the tops are lightly golden brown and a toothpick inserted in the middle comes out clean, or with a just a few moist crumbs attached. Cool muffins 10 minutes in the pan before transferring to a cooling rack. In a medium mixing bowl combine the confectioners' sugar, lemon juice, zest, and milk; whisk until smooth, adding more milk as needed to reach desired consistency. Drizzle over the muffins right before serving. These look amazing!! Any thought on GF and/ or DF substitutions? If so please email! Thank you!! Thanks for sharing the recipe, i bet it feel so good ! Keep up the good works, cheers !! I have a lot more than twelve…I’m using a cupcake tin so that’s probably why. Can I freeze the batter? These look delicious! Could you replace the sour cream with plain greek yogurt?? I replaced the sour cream with fat free quark and I am certain that plain yogurt or cream cheese would be equally perfect. The muffins wrre delucious. I replaced the sour cream with fat free quark and I am certain that plain yogurt or cream cheese would be equally perfect. The muffins were delucious. Could I use frozen berries in place of fresh ?